They call it a shell pit because of the vast array of fossilized mollusks who once lived and died there, then became a resource to be mined as gravel and fill. But the Macasphalt (or APAC) shell pit just east of Sarasota, Florida contains plenty of vertebrates as well – the mortal remains of the extinct (various species of kingfisher and duck and gull, Titanis walleri), the extirpated (California Condor, Southern Lapwing), and a few species that are still well-known and well-loved in Florida today. Among the most famous of these is the Sandhill Crane – with its oldest confirmed remains dating back 2.5 million years to the Lower Paleolithic. Sandhill Cranes, ancient and currently abundant – the most abundant species of crane in the world – are nevertheless almost miraculous to me every time I see them. They share a noisy charisma with the Common Loon and a predatory grace with the Great Blue Heron. Whether there is one Sandhill Crane in a camas field in Montana or 1,000 in a flock on their wintering grounds, they put the charismatic AND the mega in charismatic megafauna. That’s not even counting the fact that they dance. I’ve never seen a crane dance. One of the fascinating things about the Sandhill Crane is that they have not exactly survived unchanged. The five subspecies – Greater, Lesser, Mississippi, Florida, Cuban – show the genetic marks of what the species has had to do to survive. Advance, retreat, migrate, stay sedentary, separate, rejoin. When soft wetlands full of mollusks turn to rock and gravel, adapt. When glaciers rise and fall, adapt. When ground sloths and Titanis disappear, adapt; when humans and their strange accessories appear, adapt. Despite this long history of success, today three subspecies of Sandhill Crane are endangered, the three named for places. Each is endangered because of human activity in and around the places they’re named for, chiefly habitat destruction. This is the opposite of the sorrow of their big cousin the Whooping Crane, on the brink for all of my living memory. To see something fragile and rare disappear (however artificially-imposed the fragility and rareness) is a tragedy, but to see something common and yet brilliant whittled away slowly is a different kind of tragedy. I am not saying that we need to fear the extinction of the Sandhill Crane, not just now. But soft mud can become stone sooner than we think, and there’s no excuse to be careless. 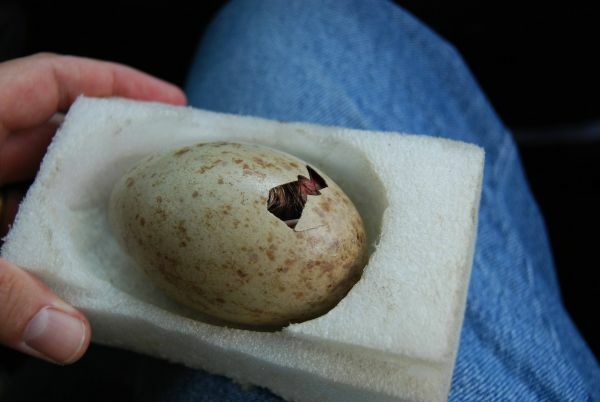 Featured image: a Mississippi Sandhill Crane egg begins to hatch, courtesy of the U.S. Fish and Wildlife Service. Fascinating, I didn’t know about the Sandhill Crane subspecies, or their deteriorating numbers. Thank you for the enlightening although disheartening post. Well stated. Where Are You Birding This First Weekend of December 2016?